Maggie and Matt’s elegant destination Sarasota wedding was a vision of beauty with towering oak trees, perfect weather and views of the serene bay. With a color palette of whites, blues, and natural tones, the outdoor Florida wedding featured neutral shades that blended in naturally with the garden surroundings. Being over 1,000 miles away, the upstate New York couple relied on online research to plan their destination Florida wedding, including reading Marry Me Tampa Bay. 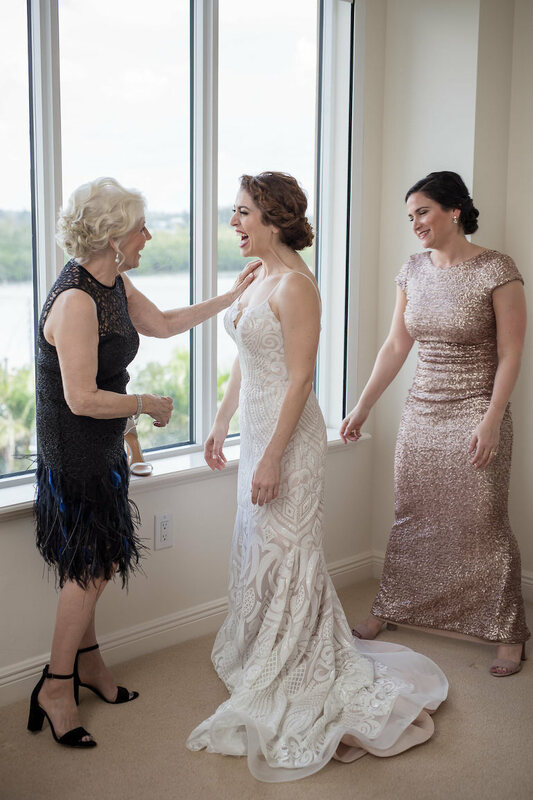 With six months left to plan, the couple knew it was imperative to find a seasoned Sarasota wedding planner who could turn their vision into reality. After hearing multiple gleaming recommendations, Maggie and Matt’s hired one of the area’s most seasoned wedding planners NK Productions. 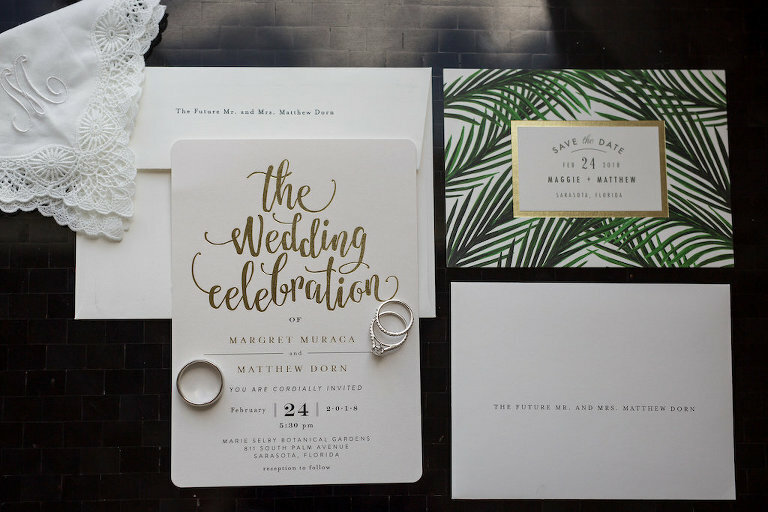 Searching for a Sarasota wedding photographer who could capture the raw emotion and sweet details from their wedding day, the pair chose Cat Pennenga Photography. Looking back on their whimsical outdoor wedding, the bride couldn’t help but remember one of their favorite memories from that special day. A photographer who could communicate the essence and emotion of the wedding through photographs. We discovered Cat with Cat Pennenga Photography through a Google search and really admired her work. She came highly recommended, so that was a definite plus. Cat and her team were wonderful; they were talented, welcoming, professional, and creative. Matt and I were very impressed and satisfied with our wedding albums. Every photo captured a special moment so well that it feels like we’re reliving it all over again. We really focused on finding a seasoned professional who could take our vision and make it into a reality. We needed someone who could minimize our stress and stay on top of all the details and logistics so we could enjoy this special time in our lives. Since we weren’t in the area we really needed someone who knew the area and had a reliable network of vendors. Where do I even start with my love, respect, and gratitude for NK Productions? From the very start, they were an incredible partner that brought much-needed support, unmatched wisdom, and a whole lot of excitement to the entire planning process. The owner Nicole and lead designer Korrin worked closely with us to understand our dream wedding in terms of design, experience, and budget. They kept us on track by constantly ensuring every detail was checked and double checked. The team made sure the wedding day itinerary was executed perfectly and that everyone was where they needed to be day of. Thanks to their efficiency and professionalism, we were able to relax and enjoy the best day of our lives! Matt had flown down to Sarasota to ask for my parent’s permission. Thankfully, they both loved him and excitedly granted him permission. A week later, he proposed on St. Patrick’s Day while we listened to BB King and sipped on champagne. He whisked me away to Canada the next day for a weekend full of celebrating, laughter, and love! Elegant and romantic with a modern twist. We aimed to find a way to embrace the natural beauty of the venue and really find a way to complement the already beautiful landscape with a classic color palette. We focused on using whites, blues, and natural tones to mesh with the environment, but added subtle pops of color, mixed metals and candles as well. We had a tremendous wedding experience in Sarasota! 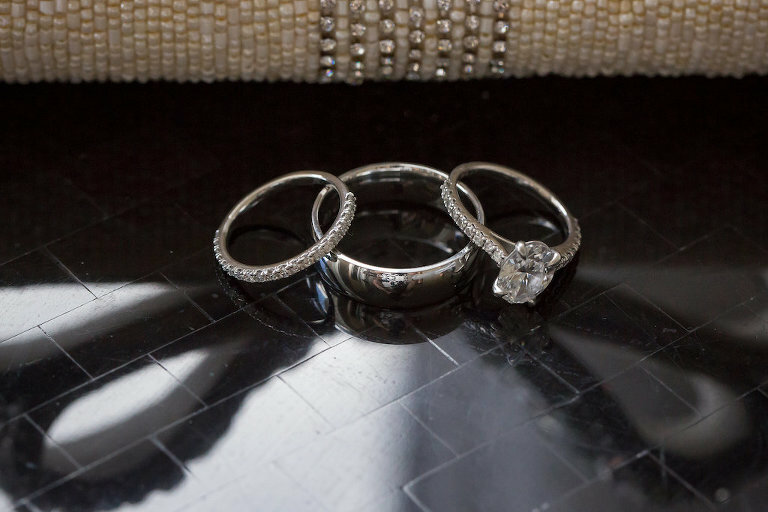 Without a second thought, I’d recommend all of our vendors to anyone in the midst of planning a wedding in Tampa Bay. Marry Me Tampa Bay was a solid resource for inspiration and vetting! Also, remember to pinch yourself every now and then because you’re getting married in one of the most beautiful places in the world!